Reflecting back on 2012, I have some regrets, don't you? I should have exercised more. I gained seven pounds while writing my book. Ugh! I also failed to do some things I said I would and let some people down. 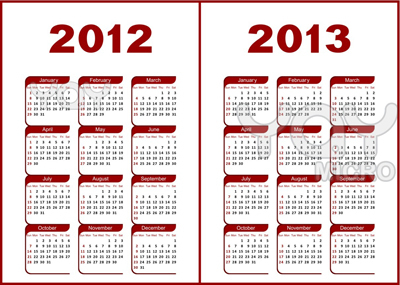 Anticipating 2013, I fear the collapse of the economy. I'm worrying about how my new book will be received and hope that I can get my house decluttered because I tell myself... then I'll be able to relax. I'm not alone. I find people have a hard time living in the moment. Here are two things that I've found helpful. Some of us live ahead of ourselves, wanting to be out of the moment we're in. We're anxious, dreading or expectantly hoping for the future moments to come. Perhaps you catch yourself saying things like, "When this happens, then I will..." or, "When this is over, then I can..."
Others live looking backwards, regretting past mistakes or reliving past hurts or failures. "If only I hadn't done this..." Or, "If that never happened, then..."
If you're the person who lives looking backwards, second guessing yourself, regretting mistakes or nursing past hurts, it hinders you from living in the present and experiencing life now. Neither can you fully participate in the moment if you're always waiting for future moments to come, whether anxiously hoping, or anxiously dreading. You're still anxious and not being in the moment. The only moment we are guaranteed is the present one. And, as we learn to live in that moment, we have important choices to make. Will we live in fear or in faith? Will we live for ourselves or for God? Jeanne Guyon advises, "What is abandonment? It is forgetting your past; it is leaving the future in His hands; it is devoting the present fully and completely to your Lord. Abandonment is being satisfied with the present moment, no matter what that moment contains. You are satisfied because you know that whatever that moment has, it contains—in that instant—God's eternal plan for you." One year my sister Patt, decided she wanted a flower garden. However, she was not interested in doing any of the work involved in flower gardening. Instead, she went to the local craft store, bought lots and lots of silk flower bushes and planted them in her soil and pots outside her home. People would drive by and admire her beautiful flowers that never seemed to wilt. She got a chuckle watching the startled faces of those who walked past her home for a closer look when they discovered that the flowers they were admiring weren't real. Sometimes in our Christian life, we want to look good to others, but don't want to put forth the work involved in learning to live a life that pleases God. We want the admiration from our Christian brothers and sisters that we're doing pretty well and have spiritual fruit in our lives. Unfortunately, we can never let them get too close, because then they too will discover that we are fake—we have no real roots. Holiness is not a life full of good works, or even necessarily of right living. Holiness comes out of a right relationship with God. "Holy holiness is a relational holiness—it is God's overwhelming presence in my life, causing me to want to do what He wills as He gives me the strength to do it, however imperfectly I may live it out." True holiness recognizes our utter dependence upon God and his grace to live a life that pleases him. What can we offer God that pleases him the most? He needs nothing from us. What pleases him is when we offer him our sins, our trust, our love, our will, and our hunger and thirst in every moment of our lives. It pleases God when we acknowledge that we are incomplete without him. John Piper says, "God is most glorified in us when we are most satisfied in him. My challenge to you and to myself this year is to live wholly in the moment and to live holy in the moment. Doesn’t Love Cover a Multitude of Sins? Question: I’m pretty sure our marriage is emotionally destructive based on all I’ve read and everything you said, but I know that I am as much a sinner as much husband is. I am no more deserving of grace than he is. We are all utterly sinful and only by God’s sheer undeserving grace are we loved and saved and brought into God’s family. The bible teaches us that “love covers a multitude of sins” (1 Peter 4:8) and “It is good for us to overlook an offense” (Proverbs 19:11). As I think about that powerful gospel truth...I wonder...is it right of me to hold my husband’s sin/blindness to his own sin against him? Shouldn’t I just keep quiet and minister to him, and pray that he will see God’s love in me? Answer: Some of you might be struggling with this same question. Who are we to judge our husband or ask him to change when we have plenty of our own sins? Jesus makes it clear. It is not our right or responsibility to judge or condemn anyone (Matthew 7:1,2). God instructs believers to forbear with and forgive one another. We know we all fail one another (James 3:2), and we’ve already seen that we should take the log out of our own eye before attempting to deal with the speck in someone else’s eye (Matthew 7:3-5). To bring up each and every offense in any relationship would become tiresome indeed. Love does cover a multitude of sins, but not all sins. The scriptures tell us to warn those who are lazy (1 Thessalonians 5:14). We are not to participate in unfruitful deeds of darkness (Ephesians 5:11). We’re instructed to bring a brother back who has wandered from the truth (James 5:19), as well as restore someone who is caught in a trespass (Galatians 6:1). When someone offends us, we’re to go talk with them so that our relationship can be repaired (Matthew 18:15-17). Yes, we ought to forgive and forbear, overlooking minor offenses hoping others will do the same for us. And, we are to speak up when someone’s sin is hurting them, hurting others, or hurting us. It’s not either or, but both. Serious and repetitive sin is lethal to any relationship. We would not be loving our husband or doing him good if we kept quiet and colluded with his self-deception or enabled his sin to flourish without any attempt to speak truth into his life (Ephesians 4:15). Yes, we are called to be imitators of Christ and live a life of love; however, let’s be careful that we do not put a heavy burden on ourselves (or allow someone else to put it on us) to do something that God himself does not do. God is gracious to the saint and unrepentant sinner alike, but he does not have close relationship with both. He says our sins separate us from him (Isaiah 59:2; Jeremiah 5:25). View the rest of Leslie's answer to this question by clicking the link below. New study guide and leaders guide! 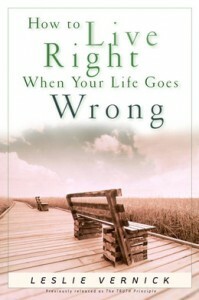 How to Live Right When Your Life Goes Wrong book by Leslie Vernick. Plus see the winner of the previous give away! Leslie has written a new study guide and leaders guide for her book How to Live Right When Your Life Goes Wrong. It is a free download and you may make as many copies as you want for a group bible study. Please email assistant@leslievernick.com if you’d like a copy. Gain a new perspective on the troubles God allows in your life. Come to better understand your response to those trials. Discover the underlying idols that hamper your efforts to change. Learn how to discern the truth of God’s Word. Develop the heart response that will draw you closer to God. Come on a journey of personal growth and spiritual discovery as your heart is drawn back to a central tenet of the Gospel: Truth isn’t something you learn, but Someone you know. And the Truth will set you free. Previously published asThe Truth Principle. Just email your name to assistant@leslievernick.com by midnight Friday, January 11th for a chance to win one of two copies! Congratulations to Linda G. of Boyertown, PA and Heather G. of Green Bay, WI winners of the How to Act Right When Your Spouse Acts Wrong book by Leslie Vernick. "Thank you for your clean, straight forward communication and teaching style and for sharing illustrations with some personal vignettes of your own life. We who attended the retreat are inspired about what we learned; and now face the challenging work of change, taking the information you shared, employing it and stepping into transformation."